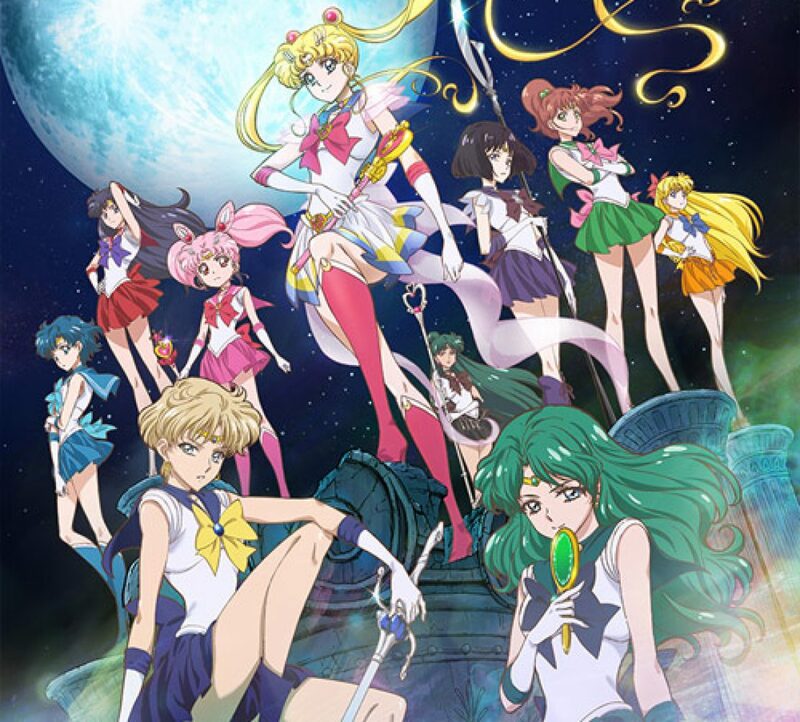 Sailor Moon Crystal Episode 4 Review | The Crystal Chronicles! When this episode first started, I was pretty annoyed because I wanted the series to get to Sailor Jupiter as quickly as possible and because I wanted an episode that would advance the plot as radically as the others did. However, this episode really wasn’t as bad as I thought it would be and it helped tell us more about the crystal and enemies and show us more about the relationships, especially since most of the series has been moving quickly. I enjoyed how this episode did a great job showing the senshi’s differences. 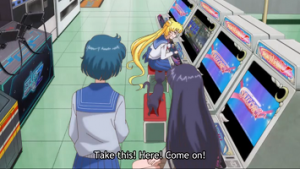 Near the beginning, Rei and Ami are stuck waiting for Usagi and later, while trying to discuss plans, Usagi is too busy playing games to pay attention. 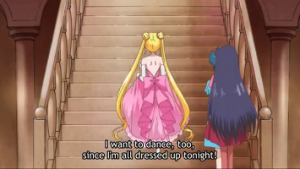 Later, Ami and Rei were trying to find the princess, while Usagi goes off to enjoy the party. It was a great way to show the difference on multiple layers between Usagi and her friends. For one, it gave us a good chance to see how Ami and Rei worked. Ami showed how she was the smart and sensible one. 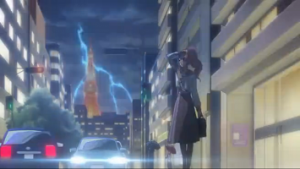 While Rei mentions already being tired of fighting the enemies, Ami focuses straight on asking who the enemy is. It was an appropriate way of getting the background out, since Ami is the one who would want the information. Ami also was the one to worry about getting in and about getting Usagi back when Usagi was wandering off. Rei, on the other hand, is more spiritual and focuses on getting the job done. She mentions her bad feelings about the party and things going on in the party. 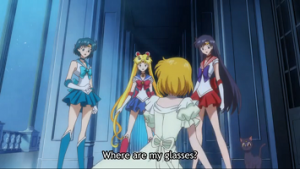 She also is the one who tells Ami to let Usagi be and work on finding the princess instead. Another good thing this episode did with showcasing the senshi’s differences, was show us the interaction between the current senshi. 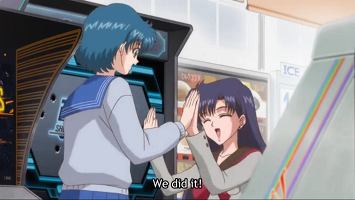 I loved the scene where Ami introduces Rei to the Sailor V video game and the excitement they have for passing the level. It’s clear how they’ve become friends and maintained it. In the original, despite being together, Usagi still wanted to manipulate Ami at times, even after becoming friends. She also, as we all remember, continually clashed with Rei. It was amusing with the tone of that series but with this one, it’s nice to see that after becoming friends, they actually have a legitimate friendship where they somewhat work together, despite their quirks. Another interesting part of the episode was the idea Usagi and identity. Her mother notices Sailor Moon in the newspaper when Usagi runs in and wonders if Usagi will grow to be like her. Later, when her father sees her in her princess outfit, he compares her to Usagi. What us long time fans know about Usagi’s identities made this very appropriate and it foreshadowed something for those who didn’t know. Now I know a lot of people (and Luna) were mad when Tuxedo mask kisses Usagi but I loved that moment. The story builds up to that very well. Take Usagi’s fascination with finding love. When she’s out on the balcony alone, she takes a brief moment to worry about where here friends are, but it quickly turns into her admiring the couples. At that moment, Tuxedo Mask asks her to dance. Later, he pulls her up when she’s falling off the balcony. 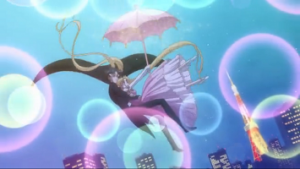 These things were adorable ways of showing their connection building up later to him kissing Usagi when she passed out and it shows us that Tuxedo Mask is interested in Usagi the way she’s is interested in him. Overall, the episode was alright. There were the usual awkward moments in the animation, the worst being when Usagi’s head goes from wide to extremely narrow when she turned to look for her handkerchief and the senshi suddenly getting abnormally skinny bodies when they watch the princess wake up. It was also an extra that disrupted the normal flow of the show; however, I think it was a decent way of establishing some of the characters we already have. The best part, though, was when they introduced Makoto, my favorite character, in the thunderstorm. I’m looking forward to that next episode.